Connie Willis, a good writer, accepts one of her Hugos. But how is she registered to vote? For years, I've read science fiction without worrying very much about the political orientation of the writers; some of my favorites apparently were conservative, some were liberal or left, some were libertarian and some did not seem to have a political orientation I could identify. It was the quality of the writing that mattered to me, and in many cases, the fiction did not seem heavily political. Apparently, this attitude was hopelessly old fashioned or naive; it seems that the Hugo Awards have become thoroughly politicized. At i09, Charlie Jane Anders explains. Via Arthur Hlavaty, a roundup at File 770. The actual just announced nominations are here. I suspect that as a reaction to bloc voting, there will be discussion of having at least some nominations come from a jury. Or perhaps juried awards will acquire more prestige. 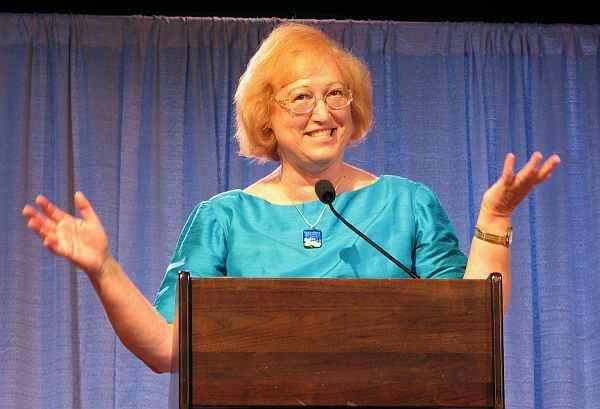 I used to be very active with the Hugos, for many years, but I quit several years ago to concentrate on the Prometheus Award -- an ostensibly political award which actually has become less political over the years. Many of our recent winners have said publicly that they are not libertarians. Obviously, I can't thrown stones at other folk for bringing politics to awards, but it does seem as if bloc voting has replaced individual nominations, and this seems like a bad development for the Hugos. Very sad. Thanks for sharing this.